This chapter examines science practices in Swedish preschools (school form for children aged 1–5 years) in relation to three central themes in Karen Barad’s agential realism: “non-human bodies as active agents”, “intra-action” and “phenomena before things”. Drawing on empirical material from my work with four preschools and one pedagogical development centre, I discuss how evening out hierarchies between human and non-human bodies could affect our thoughts about, and organisation of, science education in preschool. One example in the chapter shows how Barad’s idea of regarding phenomena as the smallest onto-epistemological entity relates to teachers’ using everyday verbs to identify physical phenomena and chemical processes in children’s interplay with the surrounding world. 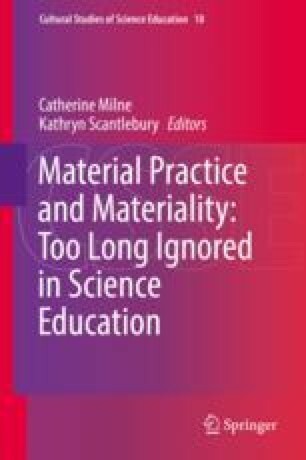 I argue that shifting perspectives from viewing science learning as learning about the material world to learning together with the material world has the potential to empower teachers since it means that science knowledge is not detached from them but is embodied and personal. Evening out hierarchies between the human and non-human does not necessarily change views on science education in one sense – the physical world still in the centre – but in another sense, it does, as teachers and children are entangled with the knowledges produced.